I know where I’m supposed to be and what to do but I know have options – I can behave and the house will be calm and boring. OR I can go where I know I’m not allowed and pick up things I’m not supposed to and Mom and Dad will run after me or chase me off the furniture – it’s SO much more fun! Yesterday I took Mom’s underwear and ran in the back yard – both Mom and Dad were trying to get me and I just ran around and around till they gave up. Eventually Mom got her underwear back. 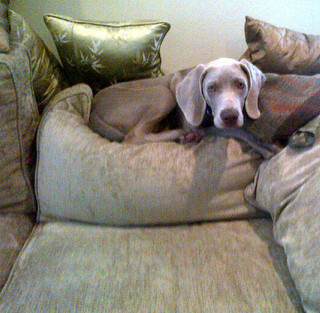 Today I decided it was “couch” time – so I jumped up on the couch. I know I can go to the comfy chair but it’s just no fun since I’m already allowed there. Well, Perry. Sounds like a good old time there! Just wait.Good and boring will come in time. Have fun while you’re young and save good and boring for another day! It will come….